In the award-winning documentary The Wanted 18, directors Amer Shomali and Paul Cowan bring to life a remarkable story of nonviolent resistance during the First Intifada. It's 1987 and the Israeli army is in hot pursuit of eighteen diary cows in the town of Beit Sahour, in the Occupied Palestinian Territories. The cows are declared a threat to Israel's national security after a group of Palestinians begin producing milk for the town's residents. These newly minted dairy farmers have to learn the most basic skills—even just how to milk the cows! But they are determined to be a model of self-reliance and provide their community with alternatives to replace Israeli goods. The Israeli soldiers find themselves in a game of cat-and-mouse as residents of the town work together to shuttle the cows from barn to barn. The fugitive cows of Beit Sahour become legendary and the “intifada milk,” often distributed under cover of night, is a part of residents' daily diet. 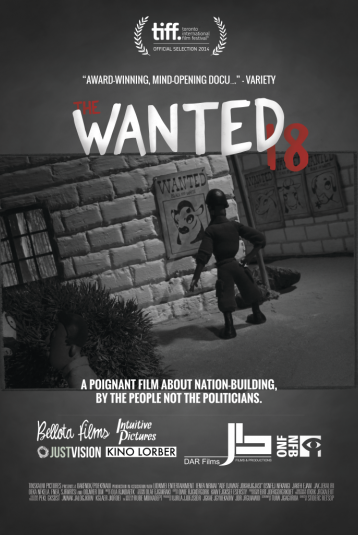 Humorous and thought-provoking, The Wanted 18 shows the power of mass mobilization and nonviolent resistance to the Israeli occupation during the First Intifada – an era too-often simplistically depicted with stone-throwing Palestinian youth facing armed soldiers. This is a poignant film about nation-building from the bottom up, by the people not the politicians.